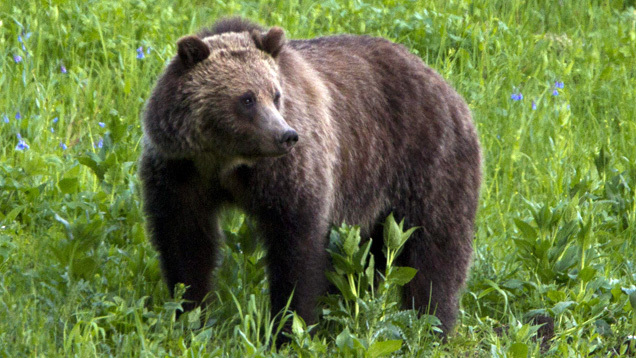 Officials at Yellowstone National Park killed an adult female grizzly bear on Thursday after positively identifying it as the animal that fatally mauled a hiker last week, the Associated Press reports. Additional support beyond the DNA evidence that this female was the bear involved in the attack include: the bear and cubs were at the attack site when Crosby’s body was found by park rangers; bear tracks of a female with cubs were found at Crosby’s body; this bear was captured at the fatality site within 24 hours of the body being found; and canine puncture wounds inflicted on the victim are consistent with the bite size of the female captured at the site. According to park spokesperson Amy Bartlett, the bear was quickly euthanized after being heavily sedated and shot in the skull with a captive bolt pistol. Bartlett says the bear’s two cubs, which also fed on the body, are in the process of being transferred to a zoo. If no zoo had been willing to take them cubs, she says they too would have likely been destroyed.